Spring Herbs - What Are We Doing Now? http://aquarianbath.blogspot.com/2010/04/spring-herbs-blog-party.html after the first of April, but I couldn't wait. The topic seemed pretty exciting to me. 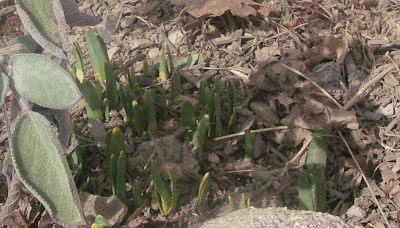 Let's face it - it has been a long winter, and neither bitter winds, nor sucking mud, nor chilling rains can stay me from the green stuff that is now carpeting the ground where only a few short weeks ago, snowdrifts lay. At the moment, I am spending a little time now and then gathering teeny-tiny leaves that my sister and I will be using in a top-secret project. Ok... you dragged it out of me. We going to play with some resin. Otherwise, the big fun right now is in finding what survived over the winter. Some of the plants fight with surrounding plants for space each year. In fact we have a lot of that around here. 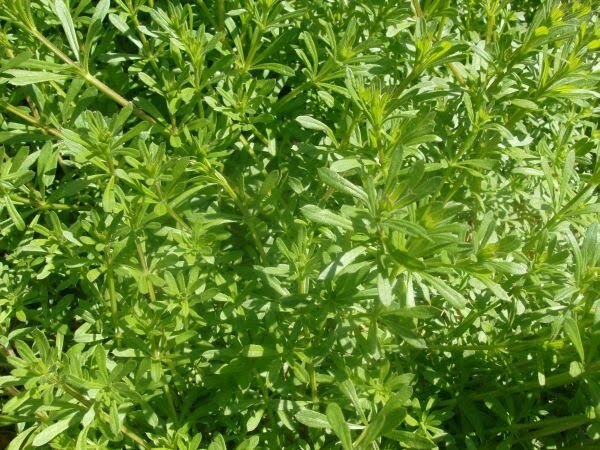 I talk a lot about the mountain mint and the various other mints (that have been plowed - heh heh heh), but there are some other herbs that are sort of bullies. Chamomile is one that is really taking over, as well as the St. Johnswort. As you can see, the SJW is already greened up and starting to move 'em out! Both of those I have encouraged, so it will be my own fault when the day comes that they require "management". 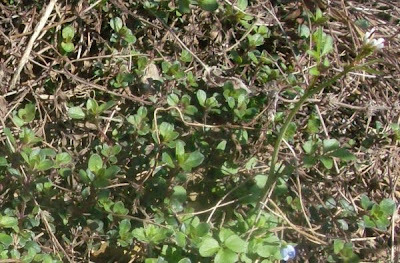 Thyme is another one, and that's sort of surprising. My luck with thyme up until now has been so-so, and right now it would seem that the thyme has taken several feet to itself. It's ok though... I like it. Some plants will produce for the first time this year, and I'm expecting the gooseberries and currants to be among them. Perhaps the figs will have time to ripen this year? Looking at the bayberries, it looks like they will also provide some wax this year. Part of every day will find me outside, pulling away some fallen leaves from the autumn, digging out some overly enthusiastic mustard or cress, or even transplanting to a better place that I remember considering from last year. Another task is cutting back the shrubs and bushes that are the foundation for the gardens. This second year parsley is back, but it will bolt quickly. Some new plants will go in and be allowed to grow while we have this to use in the meantime. If they get out of hand, they will shade everything and my beloved weeds and herbs would just vanish. Beautiful little monarda leaves are just coming through the ground. This particular plant has bright candy pink flowers in summer. It is my favorite of the monardas, followed closely by the typical bright clear red variety. The cleavers is having no trouble holding its own on the side of the house. I've noticed quite a bit of cleavers out there this year. It looks very robust. There is one valerian that has volunteered underneath an evergreen bush of some sort, and *somebody* is going to have to move, there. This is the original plant... 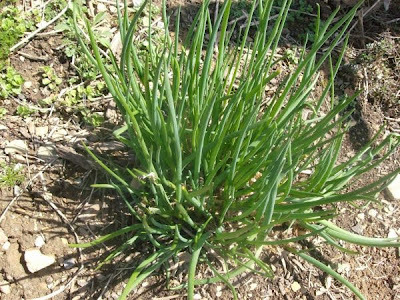 The chives have a few more weeks before they will bloom, but their succulent "leaves" wave bravely in the cool, windy weather. They are perfectly fine to eat now. I hesitate to mention this, but there is someone living under the front porch again. It is somebody small, and I think it is a chipmunk family, since they've been seen in the front garden. Oh please, if it has to be something living there, let it be a chipmunk rather than a groundhog or skunk - PLEASE!!! Chickweed is incredibly lush at this time of year. It has been around pretty much all year (except July, August, and September), but this is when it is best. So that's what I'm doing with herbs right now. Daydreaming, rearranging, nudging, making room for, and a little petting and fawning. 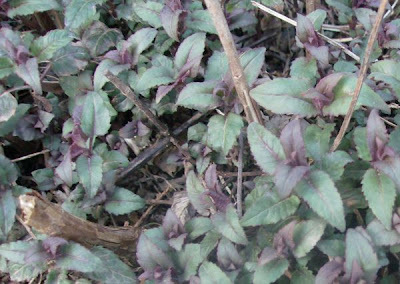 The anise hyssop is already fragrant and tasty, and the leaves are perfect for this time of year.... they somehow don't make you feel crazy if you pet them :-). Heh - Blogger just posted this before I was finished.... life on the edge is tough. 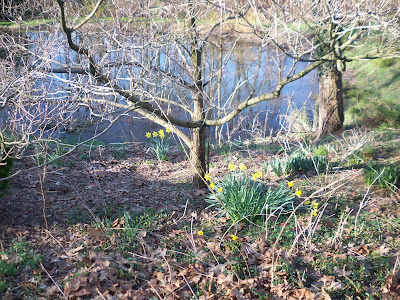 Walking down to the woods, there were daffodils blooming next to the pond. The deep blue sky and the reflection on the pond was perfect. 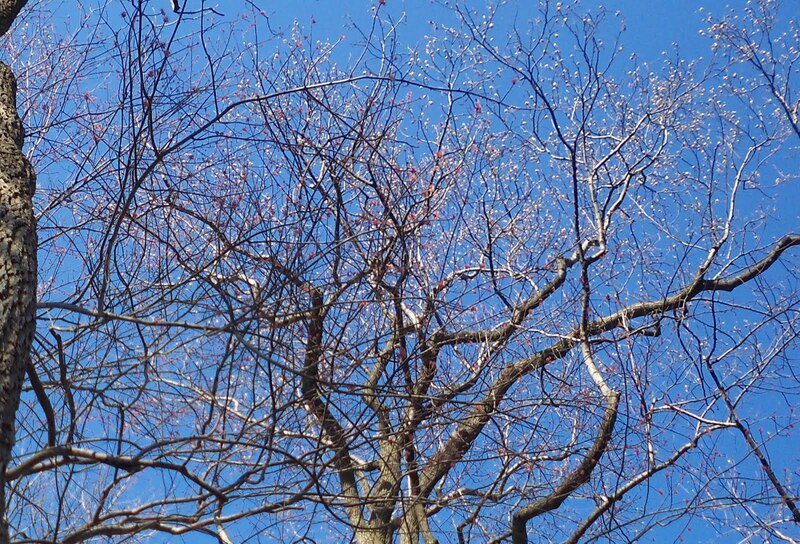 Nearby a woodpecker was giving a tree what-for. 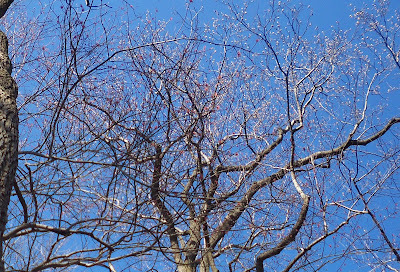 Looking up towards the sky, the trees are all bursting out with buds of various sizes, shapes, and colors - some flowers and some just leaves. Occasionally someone (ok - the sycamores) still has a few of last autumn's decor. 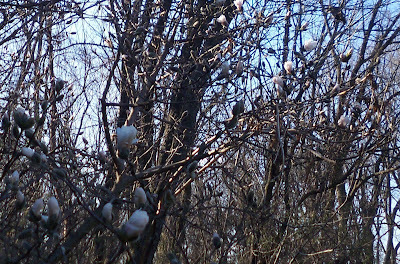 The star magnolias beside the pond are ready to go crazy. 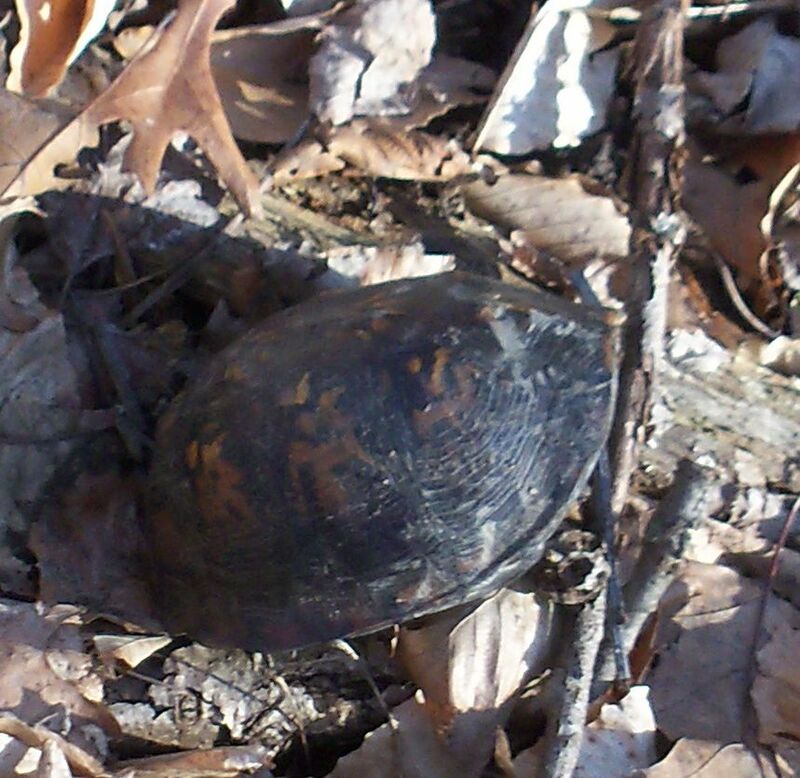 Along the creek a box turtle met a sad fate. It is rare to see them here at all, and even rarer to see the whole, undamaged shell. When we lived in VA, the dog loved turtle meat more than just about anything, and since they were so plentiful. she ate well. Here they are much less common. It seems like gradually things will start to make sense to me. Resisting change is probably normal for most - and apparently I am part of "the most". At this time of the year it is fairly pointless to do too much in the garden. Right now with the windows open, it is a warm, sunny 76 degrees inside the house. Outside the sun is warm and there is a nice breeze. So how could I NOT poke around out there? So now I have my first dirt of the year under my fingernails. The thyme is ecstatic, throwing out new growth, and the (blasted) mountain mint is seeking to take over the path. That I can do something about right now. Chamomile has also attempted a hostile takeover in the area where the chives generally have control. 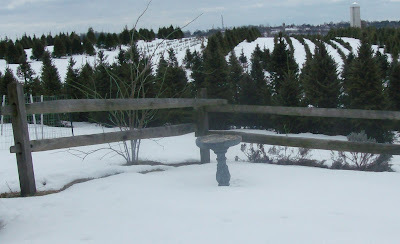 The gooseberries have the tiniest of leaves popping out between the thorns, and the blueberries... well, since they were surrounded by several feet of snow, as that snow melted the bunnies munched them down. They'll bush out soon. The worms! They started coming out of the ground by the score, and appeared to be playing like dolphins! As little bits of weeds were pulled, instead of heading in the opposite direction they seemed to be drawn to the action! I think we might have been playing together. There will probably be lots of frigid days ahead before we can finally get down to gardening, but for today... it felt great. Thinking of a title for this entry, it occurs to me that since nature is everywhere and what we do is so nature-related, thankfully (!!!) there is never truly a day "off". Even past trips to NYC have involved checking out roof gardens, the flowers offered at the Bodegas, great restaurant offerings, and trade shows revolving around business. But anyhow - yesterday was a day that was mostly computer-free. We started out early, especially since Daylight Savings Time started the day before, on the 2 hour drive to Hagerstown for a Flower & Garden Show. We were going with our friend Sharon, who lives near there. Along the way, we were treated to the sight of a bald eagle watching the rain-swollen Susquehanna River just beside the turnpike. Arriving at Sharon's, we were treated to a breakfast smorgasbord of 3 different kinds of scones, cream, breakfast roll-ups, fruit, tea - and more. It was delicious. Eventually we wandered over to the show. Once there, we had a great time talking to Barb Steele of Alloway Creek Gardens who had a lovely booth filled with herb plants and perennials. There were some other interesting things there, but the most interesting thing of all was the HUGE number of vendors that had nothing to do with flowers or gardens, and the complete dearth of display gardens and FLOWERS! It was my first and last time visiting that show. More and more, I see organizers shooting themselves in the foot by bringing in multi-level marketers, unrelated vendors, and ignoring what people came to see. If they are having trouble bringing in appropriate vendors, perhaps finding a more reasonable ($$$) venue or scaling back would make sense? Don't drag me across state lines with promises of flowers, only to show me tractors, purses, and jewelry (MLM jewelry, to boot!). But it was still a great time since the company was so enjoyable. We headed back to Sharon's for a late lunch. I don't know how that woman does it! The table was once again laid with a vast array of delectable treats, and we stuffed ourselves. Next out to the garden, where she has created beautiful nooks and spacious areas filled with imagination and a lot of hard work. The gardens are well marked, so we took a good amount of time to see what has started to come up, what survived... and wonder about some weeds. Then, we went into her sales room. She is dismantling the in-house shop this week, so I got to be her last customer! I've been wanting one of her larger plates for a long time, so there was no better time to pick it out. We drove home later in the light rain, and talked a bit (as we had throughout the day) about shows in general. Everything changes over time, and certainly the internet is part of it. I just hope that smart organizers see the trend and act instead of laying down and becoming less than mediocre. It's so good to love what you do! Over the course of the past week or so, I have reveled in the newly exposed dirt/grass/leaf litter. Not once, but twice I managed an impromptu slip 'n slide down the side yard on the way to investigate the garden, both times covering myself with mud, and laughing the whole time. Other days included things like writing articles, typing in back issues from the very early days for the next book, packing and shipping orders, and making soap. 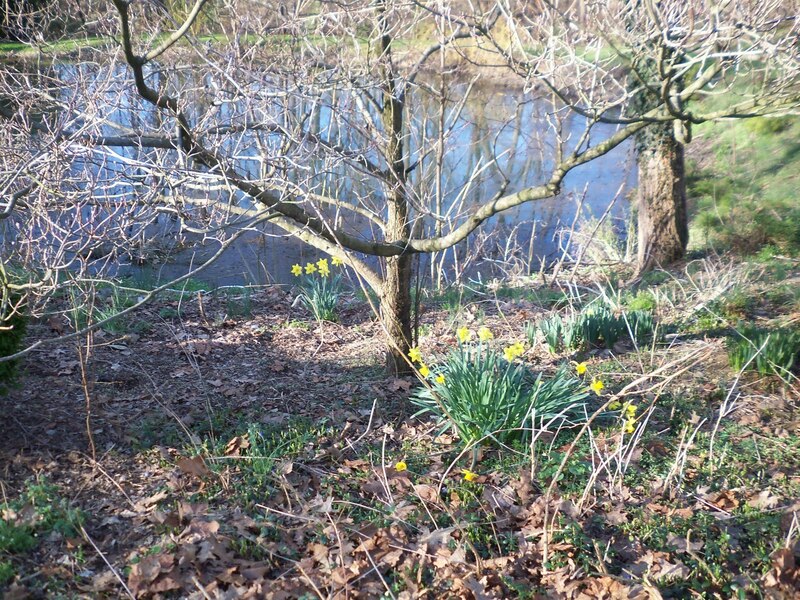 I even made it into the woods, and wandered around the yard for hours, peeking under leaves, clearing dried debris, replacing protective collars around precious medicinal shrubs, and just generally letting Mother Nature know how glad I was to smell spring's advance. We make tons of soap here - usually at least a couple of days a week are spent on that. Maryanne's Lancaster County Soap (see link in sidebar) is a wholesale business that can really keep us hopping when we aren't working on the magazine or other projects. We make a terrific product, and it's what we always use. None of that store-bought stuff around here! At the same time, it is fun to try the hand-crafted soap of other artisans. 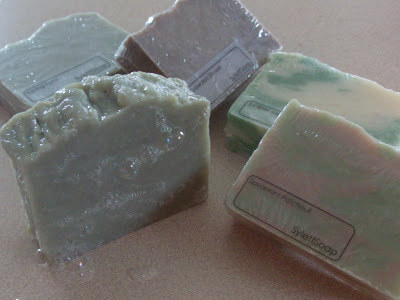 Typically I participate in a swap or two each year that satisfies my urge, but for some reason the other day I found myself at the site of Sylett Soap and decided to try a few bars. They arrived the other day, and it is some gorgeous stuff! Creamy feeling, slick bubbles, smells great, hefty bars - really nice soap! One bar of the lemon-y Saving Face is on my bathroom sink, while a second bar has been tucked away for my lemon-loving man. The kid claimed the Juniper Sage and the Crowded Shower immediately to take back to college, and the Spearmint Patchouli will soon take the place of a wickedly rich shampoo bar that I've been using as a body bar in my shower. There were a few samples included, one being a Dead Sea Mud bar. It wasn't on her site, but I do love mud bars! I will enjoy the sample. It's funny. People think that soap is soap. In a way, that is true. However, each time I try someone else's soap I am reminded of how we each work so hard to put our individuality into our products and how they really are unique to the soapmaker. Maybe I notice it more because it is something I do, but that fact alone makes me proud of this art/craft/product that we soapmakers produce. Yesterday I sent an email reminder to some people who haven't renewed their subscriptions (imagine! ), and included some fun spring-y things to make. We made this dip for a bus tour last year and did not write down the herbs as we snipped. Everyone wanted the recipe! The good news is, there isn't a real recipe. Snip a combination of herbs to equal 2 Tablespoons. fridge for at least an hour. I really like to add about 1 teaspoon of caraway seeds to the mix, too. It freshens up the whole house! This blend can really help to rejuvenate and get rid of the itchies after a great day in the garden. If you prefer to use fresh herbs, just use it all for the bath or dry the leftovers appropriately. If you've enjoyed these herbal ideas, consider a subscription to The Essential Herbal. The Mar/Apr issue is full of wonderful information, recipes, and crafts! Many myths have made their way through the years in association with a variety of herbs. Here is part two of our slight history lesson regarding the myths and legends and stories associated with the use of herbs. Lavender: • Legend says that the pleasant smell of lavender comes from the baby Jesus. After washing his swaddling clothes, Mary hung them to dry on a lavender bush. This gave the plant the scent of Heaven. • In the Middle Ages, it was believed that couples who place lavender flowers between their bed sheets would never fight. • According to myth, Hades had developed a lust for a nymph named Minthe. Hade's wife Persephone found out about Hades lust, and angrily transformed Minthe into a plant to be trampled on. Hades could not undo the spell, but he was able to ease it by giving Minthe a wonderfully sweet fragrance; one which would be released whenever her leaves were trampled on. 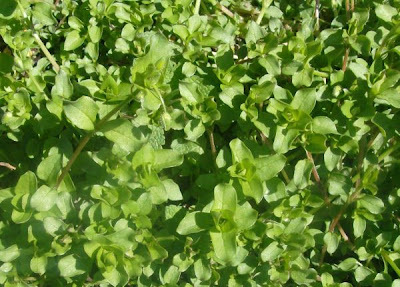 • The ancient Greeks believed that Aphrodite created oregano. They believed that if it grew around a grave, the deceased would have eternal happiness. 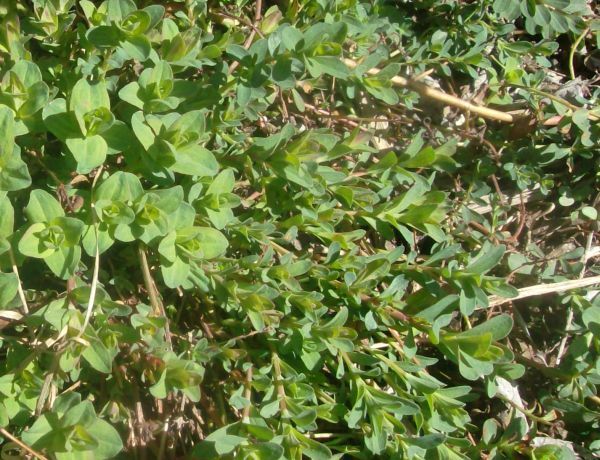 • In Germany, oregano was hung over doorways to protect against evil spells. • In the Middle Ages, oregano symbolized happiness and love. • According to myth, the first roses did not have thorns. While Venus' son Cupid was smelling a rose, a bee came out and stung him on the lip. Venus then strung his bow with bees. She removed their stingers and placed them on the stems of the roses. • Myth also says that all roses were originally white until Venus tore her foot on a briar and all the roses were dyed red with her blood. • In Christian lore, the red color of roses comes from the blood of Christ. Rosemary: • From the times of ancient Greece through the Middle Ages, it was believed that rosemary strengthened the brain and memory. When they needed to take exams, students braided rosemary into their hair in order to help their memory. • The ancient Greeks burned rosemary in order to repel evil spirits and illness. • In some parts of Europe, it was believed that if an unmarried woman placed rosemary under her pillow, her future husband would be revealed to her in her dream. • The Romans believed that sage was a sacred herb which gave immortality. 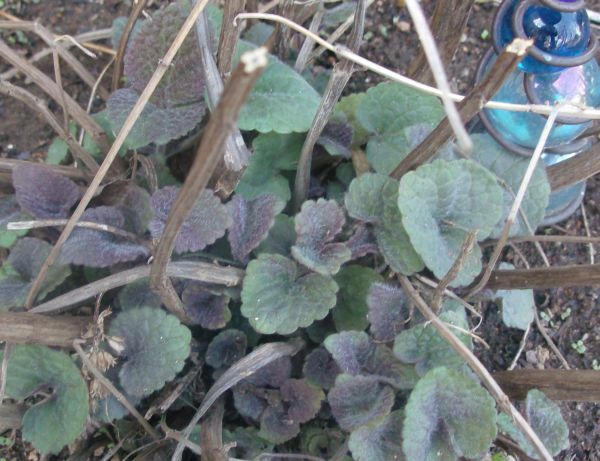 • Up until the 18th century, it was believed that sage increased fertility. • It was also believed that sage strengthened the mind. Thyme: • During the Middle Ages it was believed that the scent of thyme inspired bravery. Knights wore scarves with thyme leaves sewn on them during tournaments. • In English lore, if a person collected thyme flowers from hillsides where fairies lived, and rubbed the flowers on their eyelids, they would be able to see the fairies. So now we know. I hoped you enjoyed this two part series and if for no other reason - at least this will provide some fun discussions at your next party get together! Elizabeth Krause is owner of http://www.simpleitaliancooking.com, a website featuring many family Italian recipes which incorporate some of the spices and herbs mentioned. Sign up for her weekly newsletter where she gives additional recipes and cooking tips perfect for easy lunches and dinners! • According to myth, the beautiful Daphne was changed into a bay as she escaped the clutches of Apollo. Thus, Apollo made a crown out of bay leaves and branches and wore it in her honor. • In the 17th century it was believed that bay leaves repelled witchcraft. Pots of bay were placed in front of doorways in order to ward off evil spells and curses. • It was also believed that bay would prevent one's house from being struck by lightning. • The Anglo-Saxons believed chamomile was one of the sacred herbs given to the earth by the god Woden. • In Victorian times, chamomile symbolized patience in adversity. 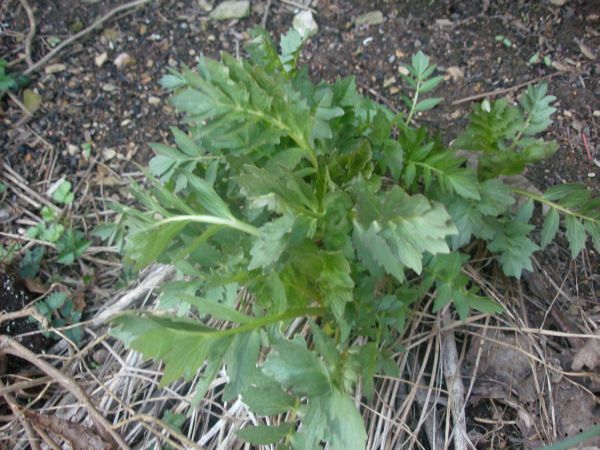 • Chamomile is believed by some to possess the power to attract money; therefore gamblers may be found soaking their hands in a chamomile infusion in order to increase their chances of winning. • The Romans believed cinnamon to be sacred, and the emperor Nero burned bunches of it as a sacrifice at his wife's funeral. • In the Middle Ages, cinnamon represented wealth and power. At large banquets, hosts served cinnamon in order to impress the guests. • When the fragrant clove forests were discovered in Indonesia, it was said that they must always be planted around water in order to flourish. • For over 4,000 years, people chewed whole cloves in order to refresh their breath (ok, this has some merit so technically it isn't a myth). • It was also said in ancient China if anyone wanted to speak to the emperor, they were required to have a clove in their mouth. • Dill represented wealth to the ancient Greeks. • During the Middle Ages, dill was believed to possess magical powers and could destroy evil spells. • A drink made from dill leaves was the remedy for anyone who believed a witch had cast a spell on them. 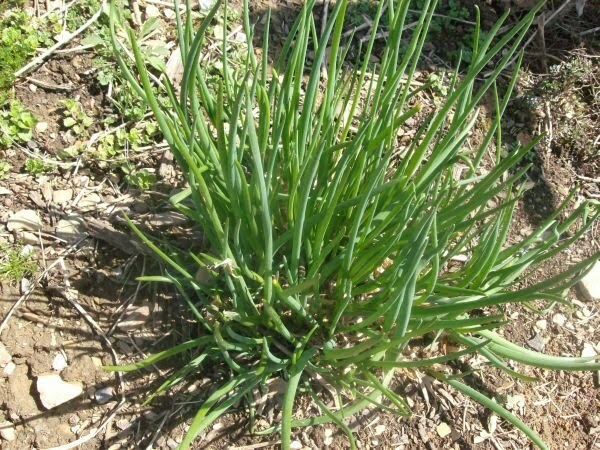 • People also wore charms made from dill leaves to protect themselves from any evil spells. • During the Middle Ages, fennel was hung above doorways and on rafters in order to ward off the devil. • Fennel seeds were also placed inside keyholes in order to prevent ghosts from entering a house. • In 470 BC the Greeks defeated the Persians at Marathon. They fought on a field of fennel, and this led to the belief that fennel inspired courage and strength. • Greek and Roman soldiers chewed fennel seeds before entering battle. Fortunately as the years have gone by, these myths and legends have been replaced with the more realistic culinary benefits of herbs. For example, bay leaf is often used in Italian sauces or stews. Chamomile is used in many teas helping to relax the muscles which is why it is often consumed prior to going to bed. Dill is used to season fish, and fennel is used to aid digestion. This concludes part one of two for Herbal Mythology. here and make sure to subscribe to her weekly newsletter featuring Italian recipes for easy and quick lunches or dinners. I finally got into the woods today, and it was good. The birds were everywhere, singing their songs, and the creek was high and hurrying along. I loved the look of this tree, clinging to the bank while hanging out over the water. It has been growing that way for several years by the look of it. This long fallen tree hosted somebody over the winter. And most certainly this is the entrance to a gnome home... In a few short weeks, this bank will be filled with the wildflowers that draw me out again and again, with their yellows, blues, pinks, whites, and magenta. Hard to believe right now. This path runs along the creek, and you can see how the deer have traveled this way many times. Along the way I saw many places where they chose to cross the water to the hill on the other side which leads to a field. Outside the shop, daffodils poke up their leaves next to a sage plant. I'm not sure who this was. A raccoon? Squirrel? The buds of the star magnolia look very promising indeed. A view of the sodden ground leading into the woods. You can hear the ground seeping water everywhere. I hear a single bullfrog call - just once. I couldn't stand anywhere for long, as the ground sucked on my boots. Finally, this growth inside the shell of a hollow tree trunk reminded me of a profile of old man winter, begrudgingly giving up his space to the spring. Give it up, pal. Ah... such sweet dreams of spring are upon us now. It's almost over, this dark, dreary spell. I could smell it. For all of our subscribers who are still waiting to recieve their copy of the Mar/Apr issue of The Essential Herbal, I need to express my frustration. The magazine actually went into the mail stream a day early - on Feb. 9th. Our self-imposed deadline is the 10th of the month prior to issue date, so it has plenty of time to meander around the country. For over 8 years, that's worked pretty well, with one or two people writing because their copy went missing. No biggie, we can replace that. This time was different. Here it is the 5th of March, and the middle of the country is still waiting. Both coasts and much of the upper and lower parts of the country have reported in that they've arrived, but not the middle. In a couple of days we'll determine just how much of the country we need to re-send to. They are continuing to arrive, with Arkansas and upper Florida checking in yesterday. We were so proud of ourselves for getting it out on time. During the month of January, we were in the hospital and then hospice every day while a member of our family died. We worked in small left-over increments of time to get everything done, and we did it. He had designed the cover before this last bout of illness struck, and the finished magazines were delivered to us on the day he died. He didn't get to see it. It is probably self-indulgent for me to write about this, but after the struggle of finishing it, prepping it, and getting it to the post office on time, it is no small disappointment to have a sack or two or three go missing. The USPS is the only option out there. Would we make more money if we went to an e-zine format? Oh, about 10 times more. No costs - pure profit. But that isn't what we do, and our subscribers have let us know it isn't what they want. So we'll keep slogging along. Post office, you really let us down this time :-(. One of the benefits of blogging for 5 years is the ability to go back and see what was really going on at this time for each of those years. I've always been prone to journaling, but in this case, many times there have been photographs and weather related rambles. Yes, it IS true that other years were greener and warmer. It wasn't just my imagination or longing. Last year was snow-covered too, though. It's sort of funny to me. My grandmother always kept diaries. She would list who she saw or talked to, often what she ate, but always some commentary on the weather. As a youngster, that struck me as such bland fodder. I mean, what about love? Where was the gossip? How did she FEEL about things? Having spent most of February "holed up", reading and writing, and thinking, I can understand that the weather is part of everything we do. Living more-or-less in the country, our activities are ruled by the ability to actually get out of the doorway and how well our vehicle navigates whatever the heavens send forth. Our moods, our communications, our movements and the very air we breathe depends on what happens outside the house. I'm not sure I ever truly understood that before. Today is almost seasonal. There is some snow melt going on, and amidst the still present drifts and piles, I was able to bend closer and see that someday soon Spring will get here. 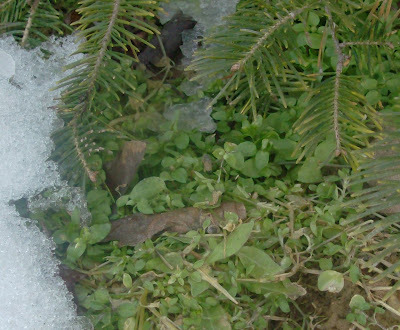 The chickweed is nestled under the evergreens. Spring is putting on her dancing shoes right now and pressing her colorful clothes. 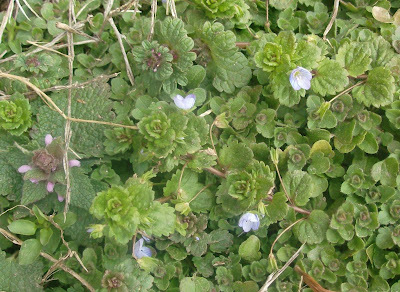 Baby blue-eyes and red dead nettles struggle forth, blooming in spite of everything. I could not be more ready.